After my trusty Pentium 4 home build finally bit the dust I’ve invested in a new desktop. Whilst performance was important for this build (as it’s my main desktop) it had to be cost effective. Luckily Intel’s new Core i3/5/7 CPUs are now mainstream and getting excellent reviews making them the ideal choice for this project. Not only are they more powerful and more energy frugal than their predecessors there is plenty of choice in their ranges to suit most budgets. Initially the i3 seemed to offer the best value for my requirements but some shopping around quickly showed that the i5’s are available for only a few pounds more. What’s more the i5 and i7’s come with the ‘Turbo Boost’ feature which looks good in theory and benefits from a snappy name. In the end I decided on the Intel Core i5 750 which gets good reviews (Best Buy Computer Shopper May 2010) and is available at almost i3 prices. It’s a 2.66 GHz Quad Core that includes ‘Turbo Boost’ but doesn’t include the built in graphics chip that many Core ix’s do (not a problem if you’re expecting to include a dedicated Graphics card). 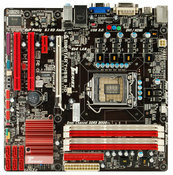 I combined the CPU with a BioStar TH55B HD Motherboard (Best Buy Computer Shopper May 2010) and 4GB of Kingston ValueRAM (2x 2GB). The motherboard comes with four slots for RAM and so two 2GB sticks under Dual Channel configuration should be fine for now and it leaves two extra slots for a future RAM upgrade. For a case I wanted something that looked good and had plenty of space for future expansion and good air flow. The Antec Three Hundred Case is an excellent midi tower case with a smart look and some quality features for an excellent price. For power I’ve gone for the OCZ ModXStream Pro 500W which seems to be well made and came with a good selection of quality power cables (and a cable bag?). I have yet to measure the power consumption of this build but I expect it to be fairly low. As I’m a big fan of Windows Home Server I tend to centralise my data storage onto the server resulting in no real need for a large capacity hard drive. I couldn’t justify the cost of an SSD drive so for this build I have opted for a new WD Caviar Blue 250GB SATA hard drive and have thrown in my 200GB Seagate Barracuda drive from my old PC as additional storage. I’ve also recycled my DVD-RW and DVD Rom’s from my old PC. Ok so that’s the good stuff now what’s the ugly duckling in the build? Well as I don’t use my desktop for gaming I have no need for a meaty video card, hence my decision to go with a budget card (the GeForce 210 512MB DDR-2 PCI Express). Performance of this card seems fine for desktop use but I am currently suffering a random glitch whereby the display sometimes seems to duplicate and not refresh correctly. This could be the card or the Nivida Windows 7 64bit drivers. Either way it is annoying and will result in either a hunt for new drivers or a new card. Other than this problem the build has been plain sailing and I would recommend any of these components, especially the i5 which so far as shown to be powerful and running at steady temperatures. Lastly I took the opportunity from this build to move to 64bit, a move I’ve been quietly resisting for a while. Whilst I needed a 64bit OS to make use of the 4GB of RAM in this build I was nervous at the thought of not being able to source drivers for older peripherals. Whilst many people recommend running 64bit few could give me a good reason that didn’t involve irregular scenarios of needing to register large amounts of memory etc. Also whilst Microsoft insists the hardware vendors now provide 64 bit drivers in order to qualify for the windows logo I suspect that these 64 bit drivers have historically undergone less testing in the wild due to the lower proportion of 64 bit Windows PCs. These days however most PCs sold seem to include 64 bit Windows 7 and so it seems a safe time to take the plunge. In the end my experience has been very positive with my peripherals and software mostly installing fine (I had a few issues with an old Logitech Webcam) and I’m pleased with the 64 bit experience.